FINAL ISSUE OF THE YEAR: Welcome to the 24th issue of ColdType for 2018. As usual, we’ve brought readers a stimulating package of stories and photographs. 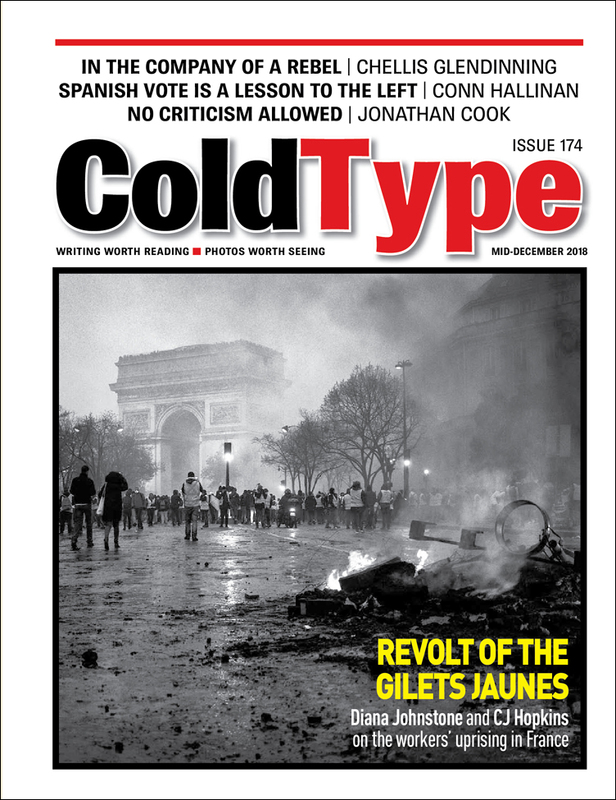 In our two cover stories, Diana Johnstone and CJ Hopkins provide analysis and opinion on the Revolt of the Gilets Jaunes in France, the modern-day equivalent of the civil unrest that tore that country apart half a century ago. Other top stories include Jonathan Cook on Israel, a country that is intolerant of criticism, while Conn Hallinan tells how Rightwing voting in Spain should act as a warning to the Left, and Nate Roberttakes us inside the abandoned palace of an Iranian princess. We’ve also got Chellis Glendinning on the life of a rebel you’ve probably never heard of, Barry Lando on George HW Bush, Sandy Tolan on the Hollywood Thought Police, Sarah Kastneron Ahed and Malala, Christopher Partridge on reggae and UNESCO, Piers Robinson on 9/11 conspirators, and George Monbiot on the Koch Brothers. Finally, to bring the year to a poetic end, we offer Stephen Gilbert’s Ode to 2018.